The FunaVid area includes a small watershed of 5 kilometers East of Balfate, Colón. It covers about 200 hectares of land, mostly on the mountain. We are setting up a large, visible demonstration area of Inga alley cropping near the top of this mountain. Inga alley cropping has been shown to be a very successful alternative to slash and burn farming, enabling the farmer to cultivate the same plot continuously without clearing more forest, but getting a very substantially better yield than from re-using old, degraded plots ( see Inga alley cropping). This will be used to promote this better farming technique to replace the disastrous slash and burn currently practiced widely in Honduras and elsewhere. Close up view of the FunaVid Inga area to be planted as an Inga demonstration facility. Photo Tiiu Miller 2009. 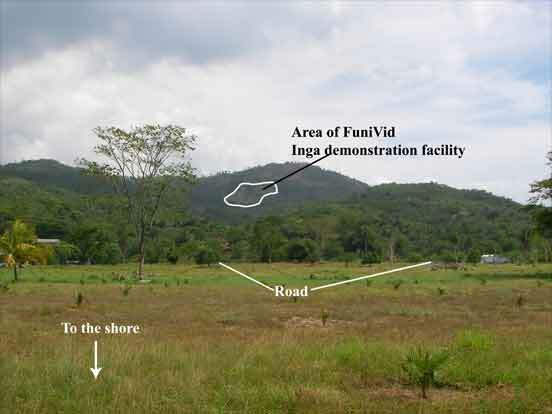 Distant view of the FunaVid Inga demonstration facility. Photo Tiiu Miller 2009. The Inga demonstration area is clearly visible from afar. FunaVid now owns most of the land at the top of the mountain, and three farmers there also want to plant Inga alleys. Thus the watershed will be stabilized. In 2010 FunaVid purchased the land directly above their existing land high up the mountain, and in 2013 the rest of the watershed at the top of the mountain was also purchased, with assistance from various sources, including RFS. About 6 hectares of this area is being planted as a large, very visible Inga demonstration facility. Planting the large Inga demonstration area on the mountain. Photo Dr. Dodson 2013. Recent rains have prevented the construction of the road up to the Inga planting area on the mountain, so heavy loads have been carried up from wherever the existing road ends. The road will be extended as an eco-tourist trail (see Eco-tourism) which finish at the Inga demonstration area. It will be useful for both publicity and educational purposes. A large Inga seed orchard has been created on the flat and more fertile land near the shore, and nurseries are being created both near the shore and up the mountain. 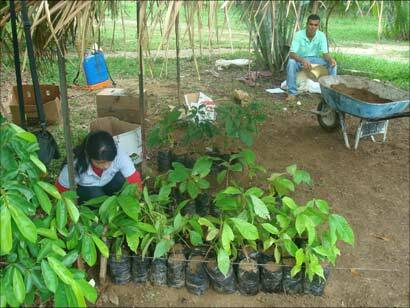 These will serve to supply the FunaVid Inga plantation and the neighborhood farmers with the Inga seedlings. 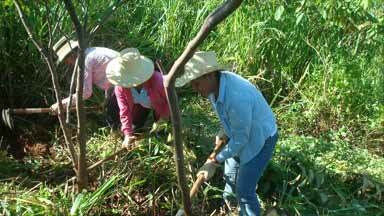 Students gaining practical experience working in the Inga seed orchard, Dr. Dodson on the right. View over part of the orchard. Photo Tiiu Miller 2013. We are participating in a joint educational program led by Dr. Guillermo Valle, who is working with other CURLA (part of the National University of Honduras) professors, and in association with the SAT tutorial program for rural high schools in Honduras. FunaVid has good facilities for educational activities. 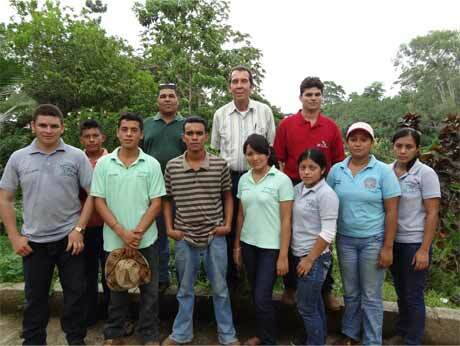 There are classroom facilities, kitchen and dining area, dormitories, and sustainable agricultural activities, including small Inga plots planted on the FunaVid Mountain by Dr. Guillermo Valle. Charles Barber, chairman of Rainforest Saver, learning Spanish from a group of students at FunaVid before start of sustainable farming class. Photo Tiiu Miller 2010. Dr. Valle and fellow professors from CURLA have been teaching local rural high school students about environmental issues, including sustainable farming and the Inga system. This is now being expanded over much of Honduras, but instead of teaching the students directly for the most part the teachers are being taught. They will then teach the students year after year. Thus far more students can be covered than if the CURLA professors tried to teach them all directly. 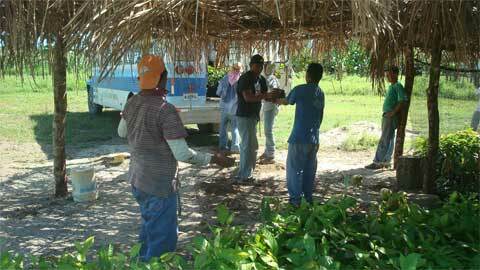 School Inga plot at the Diamante de Sion school, just before pruning. Photo Tiiu Miller 2013. Inga alley plots are being set up at the schools, particularly the ‘hub’ schools (central schools where the others from the surrounding area can come) for practical demonstrations. The students’ parents are invited to come to see these, particularly at interesting times like pruning and harvest. They will be encouraged to try the system in their farms if they wish. Some Inga in the school plots is being left un-pruned to produce seed to facilitate this. Besides this teaching 6 week internships for final year high school students are held at FunaVid. These are small groups of carefully selected students who are most likely to benefit from this particular internship. The whole teaching program is done in association with the SAT tutorial system for rural Honduran schools. An appropriate internship that is of interest to the particular participating students is part of the final year requirements. These internships at FunaVid have been judged a great success by both the students and the staff. FunaVid grows most of its own food, in an organic and sustainable way, mostly on the smaller area of flat they have by the shore. This serves as a practical education for the students too, for example in demonstrating how efficiently drip irrigation can be used. Drip irrigation: the prepared ground (Photo Rick Seal 2012) and in use. Photo Tiiu Miller 2013.